Lean Manufacturing, Lean Production, Kaizen and Continuous Improvement (dear child has many names) have created buzz for many years. Originated with Toyota’s production system, “Lean” was primarily created with manufacturing businesses in mind. Now as manufacturing businesses are increasingly rendered by service and network businesses, how does Lean paradigms go beyond gorillas’ assembly lines and keep up with the new economy? In one of my favorite articles, Casting of the Chains (pdf) from 2003, authors Ø. Fjeldstad and E. Andersen make a fruitful observation. The world has changed. From 1960 to 1999 manufacturing companies’ share of GNP in the US, as well as its workforce, fell from 30 per cent to 15 per cent, with the consequence that such businesses are now a minority of the S&P500. Banks, transportation, building, healthcare, research pharmaceuticals and other services companies have taken over. Strategic models of the world, however, have not changed. When managers develop strategies for their companies, they still use the tools and language of the manufacturing organisation. In brief, the authors found limitations in applying Porter’s Value Chain to other than traditional assembly line-based manufacturing businesses. Consequently, the authors extended the Value Chain to two more models; the Value Shop and the Value Network. The Value Shop creates value by scheduling activities and applying resources in a fashion that is appropriate to the needs of the client’s problem (typically management consulting, lawyers and doctors). Value in a Value Network is created by linking clients or customers who wish to be interdependent (typically banking, social networks and dating venues). When I joined my current employer to work with the web and startups, I did at the same time choose from working on Lean methodology alignment with one of Scandinavia’s leading media companies (see also Bharat N. Anand‘s Harvard Business Review case). Regardless of my interests in innovation methodologies and owing my conviction to entrepreneurship, I wanted to work with growth ventures rather than cutting down “corporate bacon” (is that innovation?). Later I discovered the Lean Manufacturing Startup, which basically adopts Lean Thinking and Customer Development to early-stage ventures and startups. Although Lean Startup principles are argued to be generally applicable, it has mainly been applied to Enterprise- and Consumer Software cases. However, as far as Microsoft Windows creates value by linking consumers with third party software developers, and Google links consumers with advertisers, the software business generally acts as a value network. Hence, I believe that we start to see cases with the lean paradigm being adopted to the new economy. In this manner, I assume that new schools of Lean methodologies not only help traditional management thinking avoid cramming business models with manufacturing approaches, but also preserve new-product introduction and disruptive innovation alongside continuous improvement. Being fortunate to win a scholarship for this year’s web 2.0 Expo in San Francisco (appreciation to @ericries, @SarahM and @TechWeb for having this opportunity), it is also in courtesy that I share a startup’s takeaways and lessons learned from the conference. In my approach writing for the scholarship program for lean startups, I pitched how EasyPeasy could learn from attending the conference and the Lean Startup Intensive. I described how EasyPeasy currently is seeking to validate Product-Market fit and, presumably in the customer validation phase, searching for its first transactions. Arriving at the conference after a 20 hours travel from Oslo, Norway and suffering from a mild jet-lag, I finally got to see Eric Ries, Steve Blank, Sean Ellis and Dave McClure and the reminder of the Lean Startup movement at work. In nearly every event that I was attending that week, either it was the in the talks, keynotes or unconferences, “Lean Startup” was buzzing. One major highlight was attending Matt Brezina‘s talk: 5 stages of Xobni’s growth and 5 pivots along the way. Having been a fan of Xobni for some time, I was excited to learn from their practical implications in pivoting from offering an e-mail analytics suite to that of “just” an outlook sidebar plug-in. Nevertheless, by talking to @brezina and @hnshah I had my thoughts about customer validation and pivoting matured. One week later, EasyPeasy is smoke testing for a new product offering. During the Lean Startup Intensive one common denominator came into view. Steve Blank, advocate of validating hypothesis about business models, talked about how a startup must strike balance between a product’s minimum feature set and maximum sales. Accordingly, Dave McClure talked about how a startup must balance between user hypothesis and revenue. Lessons learned, and one key tenet with the Lean Startup methodology is that a focus on validated learning will enable startups to mitigate risk in new-product introductions, often by including continuous deployment, arguably a start-charging-now and learn fast/fail fast philosophy. 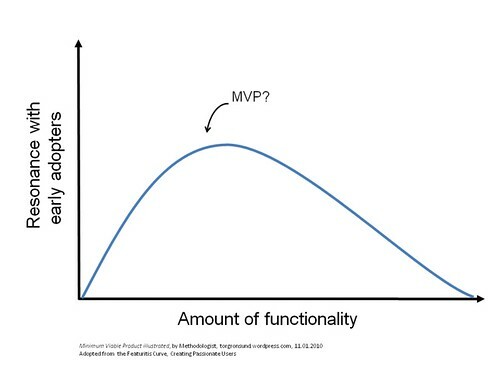 This is where the minimum viable product comes into the picture. At the second day of the conference a case of minimum viable tactics was elaborated by @drewhouston and @asmith in their excellent talk: From Zero to a Million Users – Dropbox and Xobni lessons learned. I think that this presentation gave a great many startups, including EasyPeasy, a lean toolbox at hand. The Lean Startup advocates use of metrics for validated learning. Yet, there still is one vast amount of metrics to track, dependent on what line of business you are in. At the second day, Neil Patel gave an exciting talk on Web Analytics – Tracking People and Not Just Numbers, and an amazing Q&A session about what metrics you ought to track. In plenary, Neil asked the audience for their websites’ URL, he quickly analyzed their pro and cons, and gave the audience applicable tips and tricks, all in real-time. I highly recommend his slides to be found on Slideshare, 5 Metrics You Ought to Track. Soon after arriving San Francisco I found that nearly every overseas visitor who I got to meet at the conference, in their very first morning in town, had been rushing over to the Apple store. Ourselves, arriving one day after our Norwegian fellows (we organized by extending the #w2e Twitter hashtag with #w2eNOR), we found that the iPad 3G edition was already sold out. We put our names on a notification list, hoping that another delivery would arrive at the store before we were on our way back home. Nevertheless, web 2.0 Expo hosted a couple of very popular talks on the tablet innovation, here and here. iPad were on everybody’s tongue and the big discussion tended to be about Flash vs. HTML5 and Adobe vs. Apple. Among a many good keynotes, Brady Forrest‘s chat with Adobe CTO Kevin Lynch did comb the debate. As when it comes to EasyPeasy, currently offering an open source operating system for netbooks, you might have a clue about how this might affect a pivot. Truth is that there was many interesting talks, and unfortunately one did not have the time to attend all. The main theme of the conference being Web as a Platform, there was a lot of interesting stuff on social media marketing, cloud computing, mobility, usability, virtual and social gaming. Many more events and people should be mentioned, yet I think that the above is sufficient to draw some main characteristics. Pivoting, minimum viable products and analytics were just some of the themes that were buzzing throughout web 2.o Expo. What these subjects have in common and what was an overall takeaway, whether we are talking about ever changing technologies, markets or startups, is that a strong learning culture can be source of success, or at least to fail fast. I certainly will attend the next year’s web 2.o Expo. I believe that iteration beyond the product-market flow zone could be considered pivoting – that is when you change a fundamental part of your business model in regards to products and customers. To successfully iterate between product and customers and achieve product-market fit, you would develop a minimum viable product offering that enables you to learn about your customers needs and wants. If you spend time exploring innovation methodologies and models, you know that configuration of such frameworks largely apply new ideas, assembly and build upon previous work (hat off to science). I have come to explore conformity of two emerging frameworks; the Business Model Ontology by Alex Osterwalder and the Lean Startup methodology by Eric Ries. The result, the Lean Startup and Business Model Canvas mashup is illustrated below. With the Business Model Ontology Osterwalder proposes a single reference model based on the similarities of a wide range of business model configurations. With the business model canvas (used as basis for the illustration above) Osterwalder describes nine building blocks that form a meta-business model. On methodology, Eric Ries coins the Lean Startup, a practical approach for creating and managing startups using principles of Steven Blank‘s Customer Development methodology alongside Agile Development methodologies. The Lean Startup Business Model Pattern adopts principles of the Lean Startup (i.e. agile development and customer development) with the building blocks of the Business Model Canvas. In his recent book, Business Model Generation, Osterwalder uses the notion of Design Patters alongside the ideas of Christopher Alexander and Tim O’Reilly among others, to describe common configurations of business model components. Hence, it could be considered a Lean Startup Business Model Pattern. The Lean Startup Business Model Pattern aligns with three main pillars that constitutes the Lean Startup methodology; Customer Development, Agile Software Development and Technology Commoditization. Illustrated above the template using arrows, one key tenet with the Lean Startup methodology is the understanding of Product-Market fit, which optimally results from Agile Product Development, the solution offered, to match with Customer Development, the problem that is solved for a customer. The Customer Offering or Value Proposition component of the template can be understood with the Minimum Viable Product concept used with Lean Startup method (see also whole product or doughnut diagram in Crossing the Chasm). The Customer Segments in which the Minimum Viable Product is offered, typically is characterized by early adopters or lead users in the social system. With the Technology Commodity Stack, one of the main principles with the Lean Startup, Eric Ries speaks of how free and open source software (FOSS) availability and user generated content reduce startup costs. This is typically recognized with the Key Resources component. That is, knowledge of and access to open source software is a key resource to a Lean Startup. Similarly, open web hosting services are recognized with the Partner Network component, and convenient search engine marketing with the Distributions Channels component. Social media could as an example be a aligned with the Customer Relationship component enabling user generated content and interaction with customers. Data-driven approaches based on customer-centric metrics applies to Distribution Channels, but may be considered a key activity as well. Among the Key Activities of the pattern are Agile Software Fevelopment methods and techniques, and the use of Metrics (e.g. Dave McClure‘s AARRR, Startup Metrics) for a startup to measure performance and adjust its directions accordingly. Although “listening to customers” would be recognized as a technique with the Agile Development methodologies, this is central not only to the Customer Development, Agile Development and the Lean Startup methodologies – it is also central to the Business Model Generation (Emphatic Design), Disruptive Innovation (Jobs-to-be-done), Lead User innovation and Voice of the Customer among other customer-centric innovation frameworks. The conformity of the frameworks is not straightforward though. One such problem is that the level of abstraction differs. Think numerator and denominator. How do we distinguish between tactics, process, strategy and concepts herein? According to Steven Blank’s Customer Development methodology (slide #29 in this presentation), Product Development and Customer Development can be viewed through the tactical lens, while the business model view could be viewed through the strategic lens. Osterwalder understands business models as a facilitator between business processes and strategy. Myself, I would start from the premise that strategy or goals often comes as consequence of continuous learning in early stage ventures where resources are scarce and uncertainty is extreme. One challenge to consider is how the pattern might express iterative development and internal feedback loops that are fundamental to Lean Startup methodology. It is in my understanding that when working with models and methodologies there is a general challenge in uniting behavior (process) and structure. That is, to what extent are the two frameworks integratable in terms of methodologies and notations. Borrowing from areas such as software engineering and system dynamics, future work would envision a tool that aid in entrepreneurial learning and aggregates key metrics in order mitigate risk in new-product introductions. For starters a fruitful discussion would consider what are the principles with the Lean Startup methodology that should be included in the Business Model Pattern and where they belong. Later, I will address how a startup would use the pattern to validate their business model as a part of their lean methodology. Stay tuned.